You don’t want to do like it – the dirty way. Yes, I’m too!. 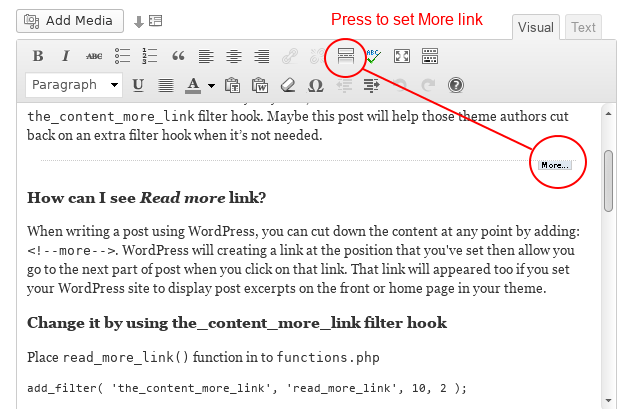 Since WordPress v2.8 introduced the_content_more_link filter hook. Maybe this post will help those theme authors cut back on an extra filter hook when it’s not needed. How can I see the WordPress Read more link/text in the editor? When writing a post using WordPress, you can cut down the content at any point by adding: . WordPress will creating a link at the position that you’ve set then allow you go to the next part of post when you click on that link. That link will appeared too if you set your WordPress site to display post excerpts on the front or home page in your theme. handle_more_link The name of the function to call when the hook fires. 10 Priority of our filter – 10 is default and lowest priority. return str_replace … This function finds the “old” continue text and replaces it with our custom text and returns that new string. By default, clicking the Read more link will open the web document and scrolls the page to section where writers choose to place the tag within a post type. Users can prevent the scroll by filtering the content more link with a simple regular expression. There are several WordPress frameworks/themes which change the default way to show Read More text/link in your website. Below are the code snippets to modify the read more link in some specified WordPress themes/frameworks. Genesis is always recommended to use child theme instead of itself. Make sure your Genesis child theme does support these accessibility features. The code snippets you see below should be placed into your theme’s functions.php file. That’s all there is to it. Enjoy your custom more link text. Would you like more WordPress customization tips? Leave a comment and let me know. do you know of anyway to change the _amount_ the page scrolls? i like the auto scroll when a more link is followed, but i have a fixed header (like yours) so it covers up the first few lines that follow the more link.